For young children, word searches are an exercise in letter matching. For older kids, word searches can be used for both reading and spelling practice. You'll find a word search you can print out at the end of this article. The words included in this search are all related to the Christmas holiday. Tell the children it is a good idea to begin their word search activity by first carefully reading over all of the words on the list. Looking at each and every word may help to increase the likelihood that the children will recognize the words as they come up in the word search. Next, instruct the children to choose a word from the list to begin with. For the sake of example, let's say that word is "Santa." Since "Santa" begins with the letter "S," explain to the kids that they can start their search by looking for an "S" in each line of the puzzle, one row at a time. Once an "S" has been located, it is time to concentrate on looking for the next letter in the word – to see if it is a match. The second letter in Santa is an "a". Look to the left, right, top, bottom and in all four diagonals of the "S" to see if there is an "a". If there is not, then it is wise to move on to the next "S." If there is, the next step would be to look for an "n," a "t," and then the last letter, the "a." Circling found words is a popular strategy. For young children who are not very accurate when making their circles, this can be difficult. An easier method is to use a colored highlighter marker. 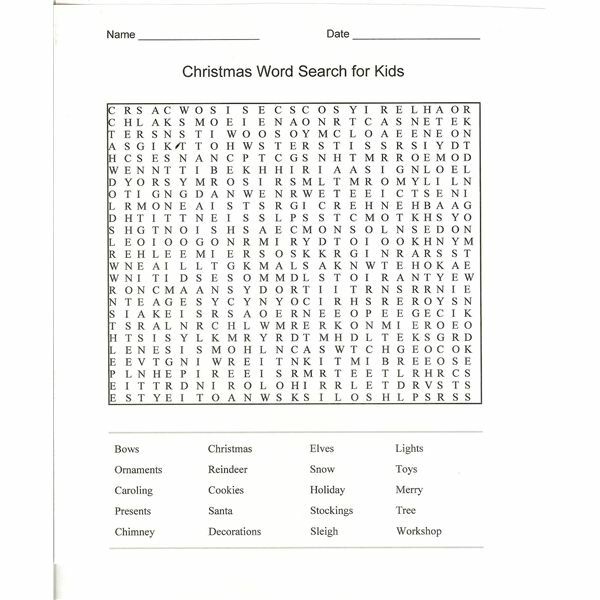 If this word search proves to be too easy, you can always challenge the child(ren) to create their own word search puzzle for the holidays. There are many sites that help you create your own puzzles for free. Word search activities for kids can even be customized using your own list of words. One of my favorite tools is the word search generator on AtoZteacherstuff.com. On this site, you can determine the size and even the shape of your word search puzzle. You can even specify the word placement options – including whether your puzzle will utilize diagonal words, up and down words or forward and backward words. Of course, creating a word search the old-fashioned way is also an option. Using a pencil, ruler and some lined paper, you can easily create the boxed grid typically used for most word searches. Next, devise the list of words you wish to include, and begin plugging them into the puzzle. Words may be written forward, backward, and even diagonally. Once the list words have been added into the puzzle, you may then fill in the rest of the blank squares with random letters of the alphabet.